Branson designed their 20 SERIES tractors with rugged, dependability in mind. The company is owned by Kukje Manufacturing of South Korea, a leader in the field of agricultural equipment with over 50 years experience in design, development and manufacture of tractors and other heavy duty agricultural equipment. FRONT AXLE: Tight turn front axle, with a lock out angle of 62 degrees with a 10 degree camber. Most tractors of this size will only lock out at 56 degrees without any camber change, making the Branson 20R units one of the tightest turning tractors in the industry. HYDROSTATIC STEERING: Allows more control if obstacles are hit with the tire, no mechanical parts to wear out. 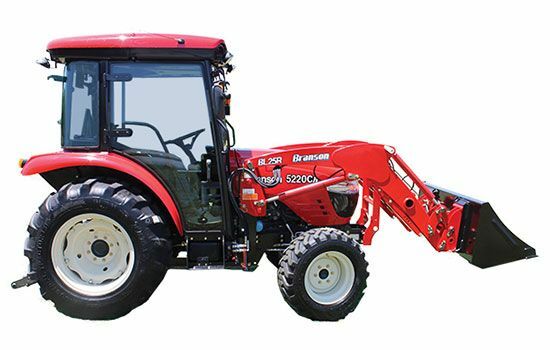 All large horse power tractors use hydrostatic steering, only the lower price tractors from China, Japan and India use mechanical power steering. DUAL HYDRAULIC PUMPS: Much smoother operation of the front end loader and the hydrostatic steering-each has its own dedicated pumps. Most of economy tractor models use just one pump, which is cheaper to produce. FULLY SYNCHRONIZED TRANSMISSION AND SHUTTLE: This transmission is much more expensive to produce but most importantly it allows the operator to shift on the go without bringing the tractor to a complete stop to change gears. CAST IRON REAR END AND TRANSMISSION HOUSINGS: It does NO good to have horsepower and not be able to transmit the power to the rear wheels. Cast iron is the best and strongest material however it is more expensive to produce. The wonderful thing about Branson is that you get cast iron on all Branson Tractor models. METAL HOOD, FENDERS WITH POWDER COAT PAINT FINISH: One piece metal hood raised by dual gas struts secured with a positive lock latch with cup holders mounted on fender. Powder coat finish prevents UV damage to the paint bringing longevity to our paint. Unlike fiberglass or plastic fenders and hoods, we use STEEL which will not crack in cold climates. WET DISC BRAKES: All of the top manufacturers use wet disc brakes; only the economy models use a dry disc or drum brake. The advantage of a wet disc brake is very simple, it is in a protected environment and the brake discs are running in hydraulic fluid. INDEPENDENT PTO: The most expensive and most sought after PTO function is independent. All of the larger horse power utility tractors use independent PTO. Independent PTO gives the operator much more control over his PTO function, plus it reduces the chance of the operator burning out his clutch because he no longer needs to engage the clutch pedal to control his PTO function. However, we went the extra mile and for those customers who want to stop the PTO with the clutch, they can do so by switching to the link position on the tractor’s PTO function switch. DELUXE SEAT: Branson has the best seat in the Industry. The seat is fully adjustable from every angle. This comfortable seat has six positions for the operator’s convenience. DELUXE INTERIOR: Step up to Branson’s newly designed interior that operators will find roomy and comfortable. The wide seat is adjustable. The gear shift and hydraulic operations are easy to understand and operate. HVAC SYSTEM: Complete climate control makes your time inside the enclosed cab comfortable. The overhead controls are easy to operate. RADIO / CD: Actually enjoy your time at work with the great sounds from the AM/FM Radio and CD player. FLOOR TO CEILING GLASS CAB: The glass panels on every side of the enclosed cab allow the driver to have an unobstructed, 360º view. The glass door panels extend all the way to the floor of the cab allowing the driver to see the ground to either side of the tractor. With ROPS - 93 in. With AG20 tires, full fuel, seat, drawbar, and ROPS - 4,246 lb. Overall - 64 - 72 in.